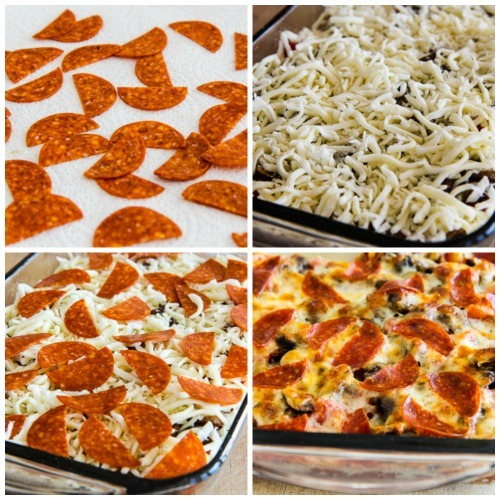 Let’s start the year out right with this Low-Carb (and Gluten-Free) Deconstructed Pizza Casserole! This recipe is low-carb, Keto, low-glycemic, and gluten-free; use the Diet-Type Index to find more recipes like this one. 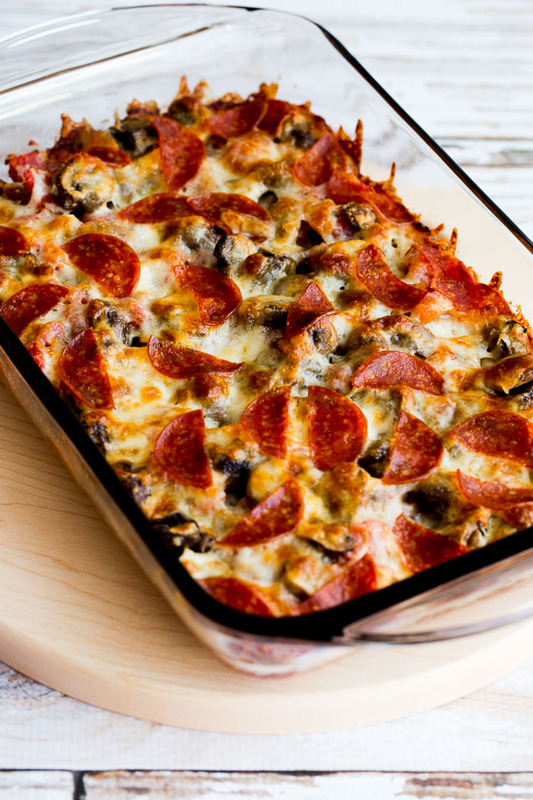 Click here to PIN Low-Carb Deconstructed Pizza Casserole! Watch the video to see if you’d like to make Low-Carb Deconstructed Pizza Casserole! I love the first day of a brand new year, and I know that’s when many of you are starting with a new or renewed commitment to more carb-conscious eating. So of course on that day I want to start the year with a new low-carb recipe on the blog. And since some people struggle with feeling deprived when they give up their carbs, if I can come up with a new recipe that can be considered low-carb comfort food, that really makes me happy. Happy New Year everyone! I hope 2016 is going to be a very delicious year for you in every way. By the way, I have one more bit of news before we get to the recipe. Now you can get posts from this blog by e-mail without having to get lots of e-mails, just sign up for the new weekly e-mail digest that comes every Sunday morning and features all the recipes from the previous week. If you’re getting back on track this January, sign up here to get each week’s featured recipes by e-mail. Dump a can of diced tomatoes into a colander and rinse; then spread them out to dry on a paper towel. Squeeze turkey Italian sausage out of the casings and brown well, then put it into a small casserole dish. Put the drained tomatoes over the sausage and season. 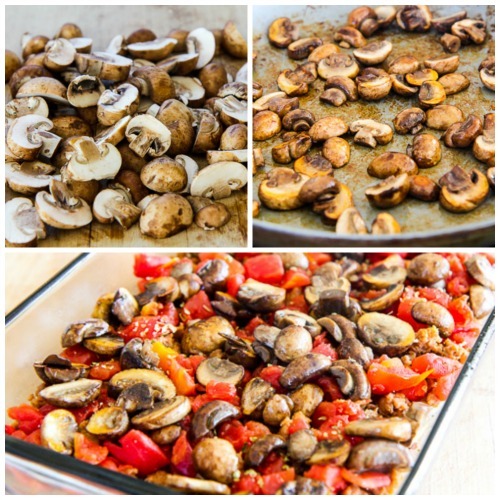 Wash the mushrooms, pat dry, and cut into thick slices. Saute mushrooms until they give up their liquid and are starting to brown, then layer mushrooms over the sausage-tomato mixture. I used my favorite turkey Italian sausage for this recipe; use pork sausage if you prefer. 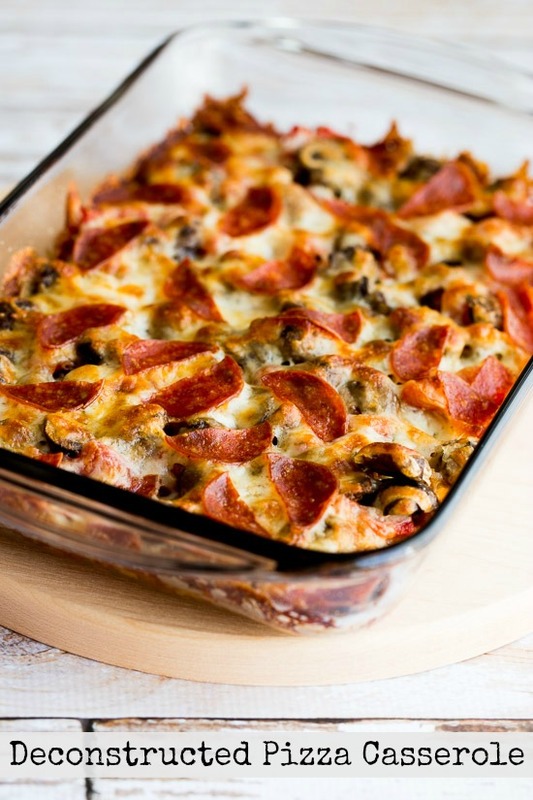 If you’re following the South Beach Diet, they would recommend using turkey Italian sausage, turkey pepperoni, and reduced fat Mozzarella for this Low-Carb Deconstructed Pizza Casserole. With those ingredients, this would be approved for any phase of South Beach. Other types of low-carb or low-glycemic diet plans may prefer pork sausage and pepperoni and full-fat cheese. I can’t wait to test this out!! I don’t think I’ve frozen it, but I do think it will freeze well. What kind of turkey sausage did u use. 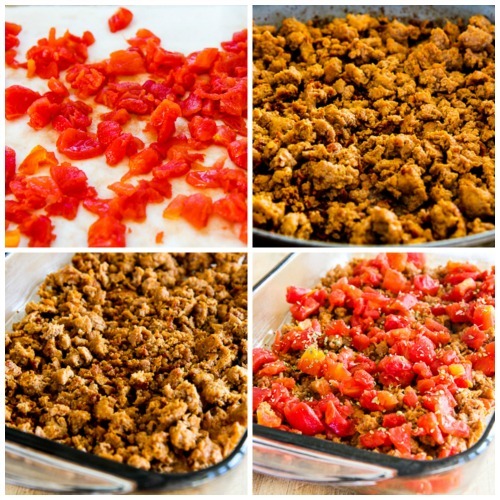 I used this turkey Italian sausage which has been my favorite for years! What do you normally serve this with? I’d serve with some kind of green salad; this Low-Carb Caesar Salad is one of my favorites. If I add zucchini, would I have to cook that with the mushrooms or adjust cook time or ingredients? I don’t know if it would make it watery.. I can’t say for sure how it would work to add zucchini to this recipe, since I haven’t made it that way. But if you wanted to try it, I would saute the zucchini with the mushrooms, using fairly high heat to evaporate as much water as possible. Cooked zucchini does have more water than cooked mushrooms though, so I can’t say for sure if it will make the finished dish more watery. I’d love to hear what you think if you try it! Did you know that someone copied your recipe, including the photo? Thanks for telling me. I removed the link because I don’t want to send people to them. Sounds really good, but we aren’t fans of sausage. Could organic, grass-fed lean ground beef be used in its place? Of course you *could* use ground beef. Whether it will be as tasty with the beef, I can’t really say because I haven’t ever made it that way. If you like ground beef on pizza, you’ll probably like it. I’d love to hear what you think if you try it. Your recipes are enabling me to stick with my keto-low carb diet and I am being successful! Thank you! I am learning to cook again! So happy to hear that Holly! This was good but very dry. Did I do something wrong? Hard for me to say without knowing just what you did or what your definition of dry is, but you can surely not drain the tomatoes if you prefer. So glad you enjoyed it Sebrenia! Why not petite diced tomatoes? I used the chunkier diced tomatoes in this to give more structure to the recipe. I worried that the petite dice wouldn’t work the same way but you can try them. Hope you enjoy the spicy version! It was soooooo good! Definitely gonna be a regular meal in our house. Thank you! My husband said he would eat this every night! With 3 boys (11,11,13) I made a full 9×11 casserole and it was gone! I upped most of the ingredients to fill the dish. I also made garlic toast for them. Have your tried making this the night before and cooking the next day? Seems like a good one to get the kids to pop in the oven on our busy nights. So glad to hear it was a hit! Sounds like a challenge feeding all those boys, glad they enjoyed it. I’m sorry but I haven’t made it ahead and refrigerated, then cooked later. It seems like it would work, although I would let it come to room temperature before you bake. I’d love to hear how it goes if you try that, thanks!